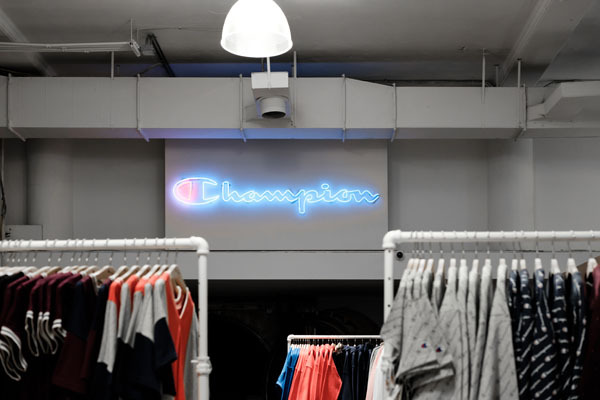 CHAMPION® ATHLETICWEAR DEBUTS NEW RETAIL STORE IN NEW YORK CITY: THE ICONIC BRAND SELECTS SOHO’S RETAIL CORRIDOR AS ITS NEW HOME FOR SECOND RETAIL VENTURE IN THE U.S.
WINSTON-SALEM, N.C. (August 22, 2018) – Champion Athleticwear, makers of authentic athleticapparel since 1919, is continuing to expand its retail footprint with a second U.S. retail specialty storeopening in New York City, at 434 Broadway. 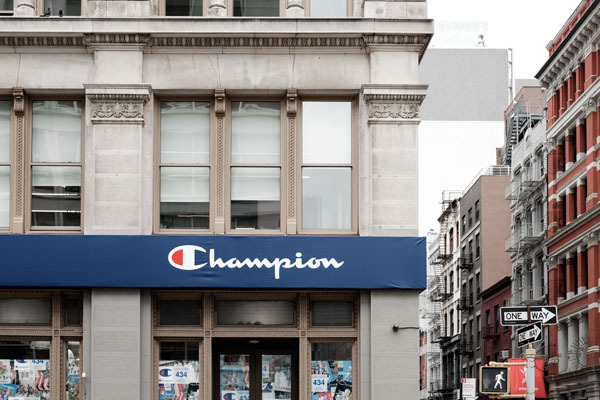 Originally founded in Rochester, N.Y., Champion selected Manhattan because of its global reputation as one of the world’s top shopping destinations. The SoHo neighborhood, in particular, embodies a sphere of significant influence within fashion, art, sports and entertainment. At the store’s grand opening on Saturday, August 25, the first 500 customers to shop will receive a limited-edition canvas tote bag with exclusive art designed by Andre Trenier, a local Bronx artist. The 4,900 square-foot store will feature onsite customization, which now includes embroidery and patches, allowing shoppers to design one-of-a-kind Champion garments made on-demand and tailored to their specific preferences. In addition to customization, there will be specialized product assortments available only in the SoHo store, including the ongoing collaboration with designer Todd Snyder and both the European and Japanese collections. Regional collections, inspired by the New York City area in which the store resides, and exclusive styles, colors and partnerships with local artists such as Andre Trenier will be available. With Champion’s step back into footwear this year, a dedicated wall of sneakers will feature items from its new fall 2018 product line. Ranging in materials from suede, leather and knit, the retro-inspired joggers are perfect for consumers looking to shop classic footwear pieces. In conjunction with the launch, the store will celebrate the 80th anniversary of the brand’s iconic Reverse Weave® sweatshirts and hoodie. 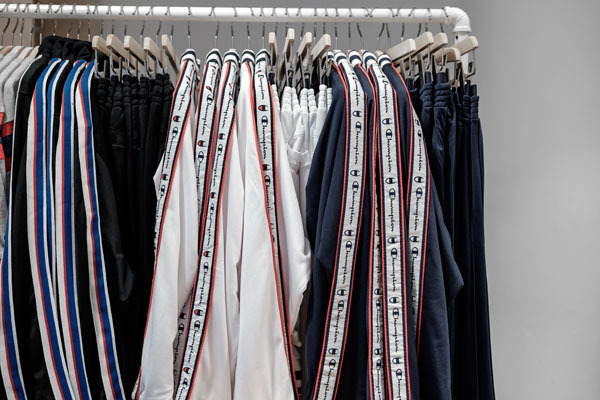 Five vintage Reverse Weave® items, the brand’s signature franchise, will be displayed throughout the store. To continue the celebrations, a limited-edition anniversary style will be available exclusively at the store in fall 2018. The retail space will display archived pieces of historical significance for the very first time in a permanent vault, allowing Champion fans to better experience the brand’s rich history while in store. Archived pieces include a football jersey, Dream Team jersey, collegiate jacket, an early sweater and a t-shirt. Through a combination of new and vintage imagery, product displays and merchandising, the store’s design provides a perfect backdrop to bring its heritage to life. Key materials used throughout the store provide a sports-inspired arena for customers to utilize, including actual bleachers for a functional seating option and recycled basketball courts reimagined as display fixtures. 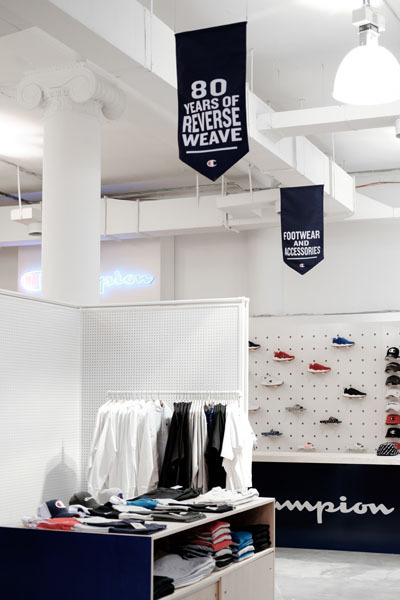 Situated in Lower Manhattan, the store creates a space for shoppers to visit when looking for classic styles, every day staples or bold designs, all curated and merchandised by Champion for a unique experience.